Dana Point is located in the South Coast region of California, within the Dana Point State Marine Conservation Area, and is near the Dana Point Mussel Watch site. The Ocean Institute is located at the entrance of the long reef and provides educational materials to the numerous schools that visit this site, some that make the hike to the monitoring location at the end of the reef. The site is located at the upcoast portion of this reef and is characterized by granitic boulders mixed with flattened benches. Dana Point is dominated by a mixture of consolidated bedrock and sandy beach, and the area surrounding the site is comprised of a mixture of consolidated bedrock and boulder fields. The primary coastal orientation of this site is south. 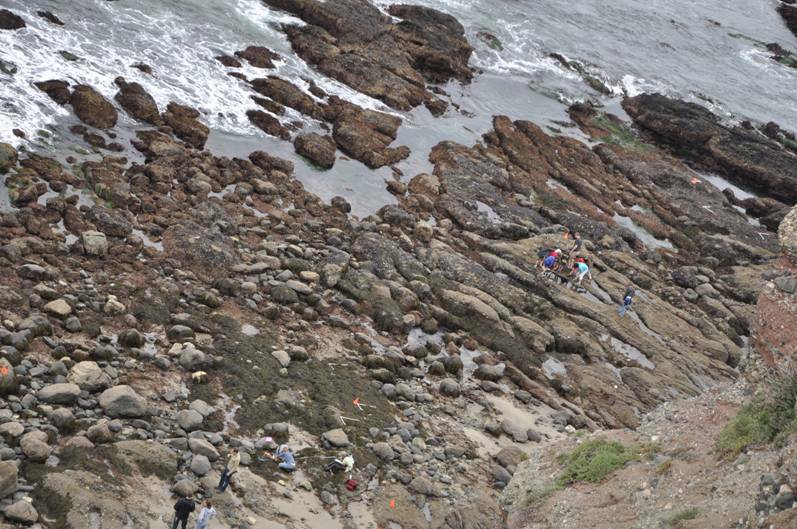 Long-Term Monitoring Surveys at Dana Point were established in 1996, and are conducted by California State University Fullerton and California State Polytechnic University, Pomona. Long-Term MARINe surveys currently target the following species: Chthamalus/Balanus (Acorn Barnacles), Mytilus (California Mussel), Silvetia (Golden Rockweed), and Pisaster (Ochre Star). In addition, motile invertebrates and mussel size structure are monitored at this site. Click here to view Long-Term trends at this site. Biodiversity Surveys were done by University of California Santa Cruz in 2001, 2006, 2010, 2013, and 2018. The Biodiversity Survey grid encompasses one section that is approximately 30 meters (along shore) x 25 meters (seaward). Click here to view Biodiversity Survey findings at this site. For more information about Dana Point, please contact Jayson Smith and Jennifer Burnaford.